We take pride in being a diverse organisation, enriched by the participation of all individuals and communities. We are committed to creating inclusive environments, where unlawful discrimination on any grounds is eliminated and good relations between people from different backgrounds and equality of opportunity are promoted. The promotion of diversity and inclusion and the genuine equality of opportunity for all are central to ensuring fair employment and high quality service provision. We work actively towards eliminating discrimination and work towards a culture where discriminatory behaviour by our employees, volunteers and trustees is challenged. We are an equal opportunities employer. Our policy is to ensure that no supporter, service user, employee, volunteer, trustee or job applicant receives less favourable treatment on the grounds of ethnicity, faith/religion, age, gender, gender identity, marital/civil partnership status, sexual orientation, disability, maternity or pregnancy, or that they are disadvantaged by conditions or requirements that cannot be shown as justifiable. We are committed to make our own website as accessible as possible, whatever people’s abilities or disabilities. Our website has been tested using the following assistive technologies and applications: JAWS 13, NVDA 2011 / ZoomText 10, Dragon Naturally Speaking 12. In March 2016 we asked the Shaw Trust to look at our website including using manual user testing to help us improve its accessibility. The site was tested by a keyboard only user, a voice activation user, a screen reader user, a low vision user, a colour blind user, a deaf or hard of hearing user and a user with learning difficulties. After seeing the feedback, we have gone back through the website to make sure we’ve got the basics right with link and image descriptions and header structures. We’ve also produced a checklist for our staff to refer to when creating new content to tighten up our process. There are some limitations the testing showed us that we’re working to fix as quickly as we can for a small charity, you see the details below. At the top of every page you will see a Skip to main content link. This will allow visitors using mouse-free or screenreader navigation to skip straight to the substantive content of web pages, bypassing the repeated page header and menus. Users can now navigate pages using the TAB key to move through all the clickable links on a page. (If applicable, you can also use Shift + TAB to move through the links in reverse order). When selected, links will be highlighted. To click on the link, press Enter. We are aware of certain buttons on container pages (see for example https://www.livingstreets.org.uk/who-we-are/press-media) without link titles. This is a restriction built into our current content management system which we are working to fix. We are also aware that the social media icons at the bottom of our pages are not currently descriptive. We’re aware that our email signup form at the bottom of the page doesn’t currently show which fields are mandatory, we’re hoping to get this fixed soon. Some of our downloadable PDFs haven’t been designed in an accessible format. We are working to make sure we change this in new PDFs that we upload. If you need an existing document in another format, please let us know. We’re very happy to hear from you if you need us to provide some of our content in an alternative format to help you access it. This may include information from a page or a PDF of other non-HTML document that hasn’t been uploaded in a form that works for you. Get in touch by emailing info@livingstreets.org.uk. 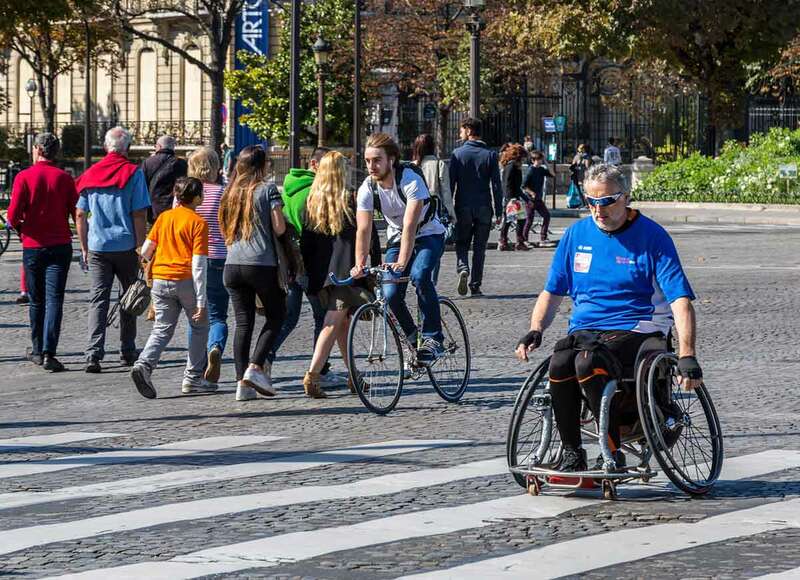 Living Streets delivered an innovative project with special educational needs (SEN) schools to address the barriers to independent and active school travel, under the name Move Makers.